To the answer “Progressive Aerodyne!” comes the Jeopardy question, “What LSA company thumbs its nose at the bad economy?” *** Certainly one of the most-fun LSA flights I’ve had in some time came at the controls of that company’s SeaRey amphibian.My LSA pal Dan Johnson recently wrote up a piece on the amphib which spurred me to excerpt some highlights in advance of my own flight report on the lively sea bird coming soon in Plane & Pilot magazine. *** Wayne and Kerry Richter, second and third generation founders of Progressive Aerodyne, started back in the ‘70s with many memorable UL birds they created with dad/grandfather Stanley Richter. The company then was Advanced Aviation and it put out, among other craft, several iterations of a very popular ultralight amphib: the Buccaneer.Building on that success, as Dan notes, Progressive Aerodyne popped out 31 Experimental Amateur Built kits in 2010. *** After Sebring 2011, they sold 14! That's impressive for any aviation company in these difficult times. *** All those new builders will have lots of company: more than 600 SeaRey builders are already splashing into lakes and rivers all over the world. *** The kit goes out the door at around $70,000. *** And as I reported last month, Kerry tells me the SeaRey SLSA should be through ASTM accreditation by Oshkosh and will sell in the neighborhood of $120,000 — "loaded" — a very attractive price for an amphibian. *** I went to Progressive Aerodyne's factory in Tavares, Florida after the show to shoot and get the tour. Kerry is one busy designer. He demonstrated a folding-wing option he’s developing that can be done, on land, by one person! *** If you’ve got flying from water on your mind, this is one hot setup. Other LSA amphibs have yet to make the big splash SeaRey has. *** A good part of that has to be its nearly two decades of design refinements and a cohort of happy owners. Here's one well-seasoned, robust design...and one heck of a lot of fun to fly. To the answer “Progressive Aerodyne!” comes the Jeopardy question, “What LSA company thumbs its nose at the bad economy?” *** Certainly one of the most-fun LSA flights I’ve had in some time came at the controls of that company’s SeaRey amphibian.My LSA pal Dan Johnson recently wrote up a piece on the amphib which spurred me to excerpt some highlights in advance of my own flight report on the lively sea bird coming soon in Plane & Pilot magazine. *** Wayne and Kerry Richter, second and third generation founders of Progressive Aerodyne, started back in the ‘70s with many memorable UL birds they created with dad/grandfather Stanley Richter. The company then was Advanced Aviation and it put out, among other craft, several iterations of a very popular ultralight amphib: the Buccaneer.Building on that success, as Dan notes, Progressive Aerodyne popped out 31 Experimental Amateur Built kits in 2010. 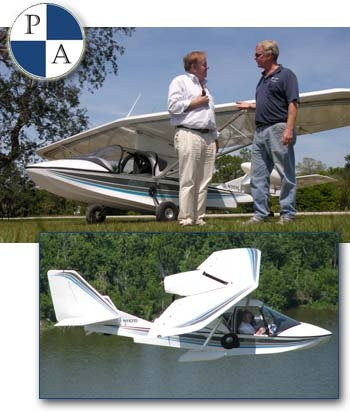 Progressive Aerodyne and their popular SeaRey amphibian represent a current-day success sufficient to generate envy in most airframe sellers. Consider these results: Searey delivered 31 kits in 2010, an average 2.5 per month during a lousy year. Plus, in just three weeks since Sebring another 14 SeaRey kits have been ordered, upping the monthly average to 4.0. True those SeaReys are Experimental Amateur Built (EAB) kit models and so don’t compare directly with SLSA sales. *** In less than three years, company spokesman and sales director Darrell Lynds (formerly with SportairUSA) took the company from one kit a month to its current pace, along the way building a list of 1,700 very interested potential buyers. He says his 2011 orders are cash-in-hand and projects a solid year for the amphibious seaplane producer. This adds to a remarkably loyal following of 600 SeaRey aircraft builders. How can the central Florida manufacturer be doing so well? Here's a glancing blow at some products you might want to check out in depth: *** A cute new LSA named Viper SD-4 showed up, beautifully built (in Slovenia) and should be very attractive to anyone who likes the conventional approach of an all-metal airframe done in the traditional way — with a modern technological boost. *** The parent company, Tomark Aero, uses CAD design and CNC precision cutting methods. *** US distribution will be through Tomark Aero USA, located in Frisco, TX. *** Some specifications: • Wingspan 27' 10 1/2 " • Max weight 1,320 pounds • Cruise 108 knots • Max speed 120 knots • Stall 40 knots • Climb 1,280 fpm • Take-off run 525 feet • Landing run 722 feet *** Wild and Crazy in a Flying Boat: that's what I'd title a short movie I'd make of my fun ride with Kerry Richter, designer of the SeaRey amphib, took me for a way-too-fun ride over, around, onto and off of a nearby lake. We chased the shouting windspray along, so to speak, and I was completely jazzed on how much fun, and how easy, that 19 year old airplane is. *** More than 550 have been built as an Experimental Category kit. By Oshkosh, Kerry hopes to have finished ASTM certification for the SeaRey LSX, which will be an S-LSA. *** Boating around on near-glass smooth water, chasing other seaplanes around, not to mention a duck or two (no birds were injured in the filming of this fantasy movie), and making several landings myself, were so doggone much fun and frankly so easy, and so bullet-proof, that I felt like I'd been flying the bird since I was hatched. *** Really, this has to be the easiest and most goof-proof airplane I've ever had the pleasure to fly...and that includes hang gliders, which in spite of all the media hysteria are as easy to master as a bicycle. *** I'll go into detail in my pilot report for the magazine, but here's a teaser: *** "Wanna see an accelerated stall?" Kerry asked. *** "Sure," I replied, silly me. *** He snap-rolled the airplane into a 60 degree bank (if not more), then racked the stick back all the way to the seats. Holy moley! I thought we'd do an accelerated stall and drop into the water not far below like a cormorant gone fishing. *** No way. The SeaRey held on as if we were on a roller coaster car on rails. *** Then Kerry got my attention by demonstrating a departure stall in the same Ramboesque manner. *** He pushed the throttle to full power then yanked the stick back hard, you guessed it, all the way to the seat again. We snapped up to at least a 70 degree angle, my stomach landed somewhere back by the (retracted) tailwheel... and the airplane just hung on, and hung on, and hung on... and never broke into a stall. "It may not be idiot proof, but it is pretty much goof proof," he said laconically. I just grinned like a fool. *** "Just out of curiosity, what's the load factor?" *** "Six g's positive, four negative." *** Landings are so easy. Takeoffs? We actually did one without touching the stick! Using rudder alone to keep things straight, we accelerated to about 60 mph and she popped off on her own. *** Add the SeaRey to the growing list of airplanes I'd buy tomorrow, if only I'd had an inheritance or a winning Lotto ticket. Here’s a glancing blow at some products you might want to check out in depth: *** A cute new LSA named Viper SD-4 showed up, beautifully built (in Slovenia) and should be very attractive to anyone who likes the conventional approach of an all-metal airframe done in the traditional way — with a modern technological boost. *** The parent company, Tomark Aero, uses CAD design and CNC precision cutting methods. *** US distribution will be through Tomark Aero USA, located in Frisco, TX. *** Some specifications: • Wingspan 27′ 10 1/2 ” • Max weight 1,320 pounds • Cruise 108 knots • Max speed 120 knots • Stall 40 knots • Climb 1,280 fpm • Take-off run 525 feet • Landing run 722 feet *** Wild and Crazy in a Flying Boat: that’s what I’d title a short movie I’d make of my fun ride with Kerry Richter, designer of the SeaRey amphib, took me for a way-too-fun ride over, around, onto and off of a nearby lake. New Factory -- If you're in the neighborhood or simply enjoy a good time, you can attend the SeaRey Open House on Saturday, June 26, 2010 starting at 9:30 AM. They say, "Fly in, drive in, or boat in... it's all good!" RSVP to factory@searey.com or call 352-253-0108. Not only does SeaRey have a showroom at their new headquarters, they have hangar space and a builders area for customers. Progressive Aerodyne was aided by "dozens" of owners as they moved lock, stock, and barrel to their new factory. They were up and running in eight days! As the SLSA SeaRey works toward certification, a folding wing became part of the attraction. Recently, I blogged about a Tennessee town that welcomed Skykits from Canada, providing a brand-new facility for them to use. A town in Florida also saw the potential of a light aircraft manufacturer and had a new building with lake access available. *** Arguably the most successful light aircraft seaplane producer is Progressive Aerodyne and their SeaRey amphibian. How successful? In January, they delivered SeaRey kit #500 to its owner in Belgium. That impressive number doesn't tell the whole story, which centers around the tight community of SeaRey builders who often help each other and not solely with builder questions. In my years in aviation, I've never seen a closer group but then, as a fellow seaplane lover, that doesn't surprise me; seaplane aviators share a common bond. Now, the SeaRey team is working hard to finish their SLSA version, giving enthusiasts a chance to buy a ready-to-fly SeaRey or a kit. *** Recently this company moved from its longtime location to a new facility. The old quarters were not on an airport or near the water. For a kit producer that was fine, but as Progressive Aerodyne heads toward fully-built production, it's far better to have a place you can fly the airplane that just rolled out of your factory. *** Several SeaRey customers helped buy the building, then physically aided the relocation effort to Tavares, Florida, a town about 45 minutes north and west of Orlando in what is often called the "lakes district" The reference becomes obvious when you look at a map of central Florida; ideal for a seaplane producer. SeaRey marketing chief Darrell Lynds reported, "Tavares has aspired to become the largest seaplane base on the East Coast. The town just completed a $7 million seaplane base, marina, and park. It will also feature premium auto gas and 100LL fuel stations. We approached them a year and a half ago about who we are and what we do. Right on the spot, the city leaders piled us into cars and drove us to this new building on State Route 19. We were stunned. The layout of the building, access to the shoreline, and distance from all other dwellings made it perfect for a SeaRey factory." Recently, I blogged about a Tennessee town that welcomed Skykits from Canada, providing a brand-new facility for them to use. A town in Florida also saw the potential of a light aircraft manufacturer and had a new building with lake access available. 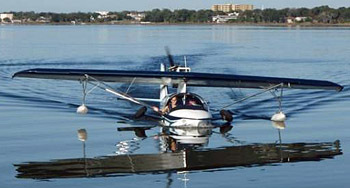 *** Arguably the most successful light aircraft seaplane producer is Progressive Aerodyne and their SeaRey amphibian. How successful? In January, they delivered SeaRey kit #500 to its owner in Belgium. That impressive number doesn’t tell the whole story, which centers around the tight community of SeaRey builders who often help each other and not solely with builder questions. In my years in aviation, I’ve never seen a closer group but then, as a fellow seaplane lover, that doesn’t surprise me; seaplane aviators share a common bond. Now, the SeaRey team is working hard to finish their SLSA version, giving enthusiasts a chance to buy a ready-to-fly SeaRey or a kit. TOP GUNS - SeaRey designer and developer, Kerry Richter (right) speaks with Damir Blazevic. The latter engineer worked for Airbus for many years, including the giant A-380 project. LONG EXPERIENCE - The SeaRey is the end product of many years of seaplane design work by Kerry Richter. He leans on the latest, the LSX model featuring 78 improvements over earlier kits. GROUND OR AIR - The SeaRey seems equally at home on land, not always a common characteristic of water-based aircraft that sometimes are quite awkward looking on the ground. CONSTRUCTION MATERIALS - The SeaRey uses fabric-covered surfaces, aluminum airframe components with some steel items, and a fiberglass hull (with an optional carbon fiber hull). LOW POSTURE - The SeaRey sits rather low to the ground. In an emergency landing you could consider landing the plane on its boathull, which turns out to be surprisingly effective. SEA LINES - The SeaRey is unmistakably a seaplane with its boathull and wing sponsons. The design has been around for years and has evolved into a Light-Sport candidate. ROTATES UP - Main gear on the SeaRey does not retract into a cavity but simply rotates up. The solution is effective on this design and makes sealing the hull easier. FAIRED 912 - Earlier SeaRey kits left the engine exposed in the ultralight way. The LSA variant of this venerable design now offers a sleek enclosure for the Rotax 912. LIT UP - With its computer info screen glowing, the SeaRey looks very contemporary. An airspeed gauge (left) and a compass (right) flank the avionics. FINISHED COCKPIT - Interiors of LSA are customarily finished and the SeaRey LSX provides the same level of comfort. WARNING LIGHTS - A light and audio warning help the pilot not land wheels up on ground or wheels down on water. The warnings are triggered by airspeed and/or flap extension. BAGGAGE AREA - The SeaRey's nicely finished aft compartment allows room for up to 60 pounds of stuff that you may want to carry with you, and it will all be accessible in flight. Note flap handle at top of picture frame. TAILPLANE - Most ultralight pilots recognize this kind of tail construction as it has successfully served light aircraft for decades. Wire bracing remains efficient and light. FUN FLYER - The SeaRey allows you to take off, fly, land, or anything else with either canopy partially open. Ultralight pilots will love this quality. Let's be honest. We're into flying because we enjoy the experience, right? Flying light, sporting aircraft is not about flying to work or transporting goods or people. And if enjoyment is the main flying goal, then seaplanes are a big part of that pleasure. 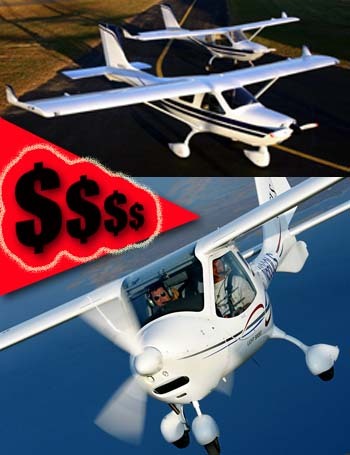 Of the LSA-qualified seaplanes covered this year (FPNA Cape Town A- 22 and Airmax SeaMax), the SeaRey is more familiar to readers of Light Sport and Ultralight Flying magazine and more affordable. The SeaRey is familiar because of its past in this community. It's built and it flies as you'd expect, more so than some $135,000 carbon fiber speedster. It also costs a great deal less and it's available as a kit to save even more dough. Make no mistake. The SeaRey LSX (the Experimental-LSA kit version) and the SeaRey Sport (the fully-built version in latter stages of certification) are advanced light planes, by which I mean SeaRey has developed significantly from its simpler 2- stroke-powered early models. The new LSX model gained 78 new improvements as it went through the process of earning SLSA airworthiness. Getting back to the fun part, many pilots who have flown in water-borne aircraft believe this is the finest and most enjoyable flying one can do. If that sentiment holds water (pardon my pun), then the handsome SeaRey amphibian from Florida-based Progressive Aerodyne deserves closer inspection. Evolving SeaRey Kerry Richter, the main designer at Progressive Aerodyne, said that new engineering strengthened the SeaRey's airframe, which increased gross weight to 1,430 pounds, up from 1,370 pounds. This was not some back-of-the-envelope analysis. Progressive Aerodyne went through an exhaustive study to prove the higher gross limit. The 78 changes the company made cover all parts of the design. 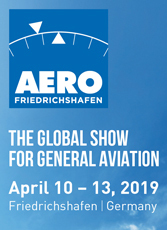 Assisting Kerry and the Progressive Aerodyne team was German engineer, Damir Blazevic, who worked for Airbus for many years and most recently on the A-380 Airbus. Kerry indicated that Blazevic gave a lot of help to Progressive Aerodyne as they worked through the ASTM standards. Boosting the gross weight was part of the overall rework effort. Some well-equipped LSA seaplanes are struggling to stay within LSA weight limits (though not SeaMax, which fits easily). Yet the SeaRey provides 550 pounds of useful load or 442 pounds of payload with full fuel in standard 18-gal- Light Sport and Ultralight Flying Pilot's Report lon tanks. Of SeaRey's load utility, Progressive Aerodyne says, "In other words [you can carry] two average people, a full tank of gas and about 30 pounds of baggage." If you want extra fuel - 26 gallons are available - you might choose an optional carbon fiber hull to reduce the empty weight by a further 30 pounds. More than 15 years of Progressive Aerodyne history cannot tell the whole story behind the SeaRey. A father-and-son ownership team from the beginning, Wayne and Kerry Richter have long experience in this business and over the years have produced hundreds of amphibious aircraft. Back in the late '80s and early '90s, the Richters were principals in a company called Advanced Aviation that was best known for its amphib seaplane called the Buccaneer. After another Florida designer, Bruce Pemberton, made the first single- place Buccaneer, and Kerry Richter cemented his reputation with a 2-place model, the Buccaneer II. He also updated the original single-place called the XA into the more sophisticated SX version. In addition, Kerry designed other models based on a similar theme. In the early '90s, after a dispute with a man who ended up owning a large piece of Advanced Aviation, the Richters parted company and set about building a new company. By the end of the '90s, their new Progressive Aerodyne company had delivered more than 100 of their then-new SeaRey plus a few of their Sting Ray single-seaters. The single-seat model quietly left the scene and the SeaRey has not only done well - selling more than 500 aircraft - but the Richters have built one of the most intensely loyal followings I've seen in aviation. For more than a decade and a half, Progressive Aerodyne has been shipping airplanes and satisfying customers. And through all these years, Kerry Richter's designs have been continually refined. All the knowledge he acquired with the earlier designs has been bundled into the SeaRey. SeaRey's Comfy Cabin A modern SeaRey has the look of a well-developed model that has seen many refinements over time. Some of these were inspired by their legion of kitbuilders, and some ideas came from factory personnel. Early on, the SeaRey moved to the 80-hp Rotax 912 4- stroke that is today the accepted engine of most light-sport aircraft. The first SeaReys used the Rotax 582 2-stroke, but half of the single-place Sting Rays built and virtually all of the 2-place SeaRey models use the popular 80-hp engine. 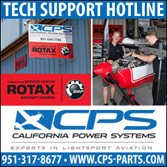 Since pilots seem to value more power than less, many now elect the 100-hp Rotax 912S and you can also choose the much more expensive and somewhat more powerful 115-hp Rotax 914 turbo. With both halves of the sliding canopies slid far aft, entry to the SeaRey is quite negotiable. Some landplanes are even easier as they can have low door openings and a seaplane cannot afford that feature. Kerry and I are both roughly average in size and once seated, we had room to spare. The thickly padded seats and fully finished interior were pleasant and comfortable. We left the canopies open in Florida's May heat and we could have elected to leave them open during any part of the flight. Except for some windblast and increased noise - especially at higher power settings and faster speeds - I think I'd regularly fly around with the canopy open. You can have each canopy half open to any degree and they don't have to be open symmetrically. Kerry said you could take off and fly with the canopies open anywhere in their movement range or the speed range of SeaRey. The split, sliding canopy is also a safety feature in the event of water upset. Getting out of a flipforward or flip-aft canopy after upset could introduce escape challenges. Progressive Aerodyne says, "Instead, our sliding canopy system would safely slice the water and also would not require clearance from ground to open." As we taxied out at Spruce Creek Fly-In near Daytona Beach, Florida, I found ground handling was very good thanks to a responsive tailwheel. But, as with any amphib, I found myself reviewing the right techniques to assure I had the repositionable gear where it ought to be. Too often, seaplanes or amphib floatplanes have been landed on water with the gear down -- a very bad idea - or landed on land with the gear up. The latter presents much less of a problem, and may even be advisable on some emergency landings. 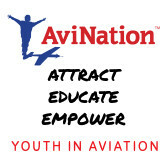 To help you make the right decision about gear position, Progressive Aerodyne has worked with Dynon Avionics to better advise pilots. The resulting setup boasts two buttons above the screen with placards reading "Water" and "Runway." After you select the one you will use, the system provides an audio warning before landing. It can prevent landing with the gear in the wrong position, a more common error than you might think. The gear-position audio warning is triggered by either speed or flap position. When you have the gear down, you hear a voice cautioning you for a runway landing. When you have the gear up, the caution is to prepare for a water landing. The trigger points for the warnings are any measure of flaps, or speeds below 70 mph, Kerry says. Some may regard the warning system as the airplane equivalent of automobile "idiot lights," but I found it helpful. On the other hand, it seemed Kerry was always reaching to shut the warning off as we practiced a few landings. This particular SeaRey (N11015) was also equipped with the new Garmin 696, which made a handsome combination with the Dynon Flight Dek D-180. Flanked by an analog airspeed indicator and circular card compass, it was all the instrumentation a seaplane pilot needs. Flaps are mechanical on the SeaRey with a control lever over the shoulder between the two occupants (either pilot can work the flaps). Positions available are 12, 24, 35 degrees, however, Kerry indicated they were considering dropping the higher setting as it is only used in more extreme situations. Hydraulic brakes are also part of SeaRey's standard equipment list. The control panel has adequate room for additional instruments, if desired. The SeaRey's wider panel has different shapes; the panel in our test plane impressed me because it made the Garmin 696 so readable. Off and Flying We left from the hard runway at Spruce Creek and flew to a nearby body of water. It looked small to me, but Kerry shrugged and said it had plenty of room. I had to trust the expert and it turned out he was exactly right. From the cement runway, rotation came in the mid-40s and we left the ground at about 50 mph (43 knots). A similar number is used on water and the run on water or land is the same, a fact that surprised me as amphibs often exhibit longer runs on water. While I did landings on terra firma, Kerry handled the water landings on the small body of water we used. It was obvious he is intimately at home with this airplane. Entry to the water was astonishingly smooth, showing the effectiveness of not only a V-shaped hull but the sweep of that V-hull. The swept V-hull comes to a point in the center and appears to account for the smooth entry. I felt none of the "chatter" experienced on many seaplanes when landing on a rippled surface. Kerry said older SeaRey models didn't act the same as this newer hull. Once in the water and motionless, the SeaRey hull drafts about 10 inches. Moving around on the water, especially in Kerry's very capable hands, the SeaRey LSX handled much like a speedboat, exhibiting a great combination of response and stability. Despite its good water manners, most land-based pilots find one control technique counterintuitive. You use opposite aileron in turns to keep from planting a sponson while zipping about on the water. Kerry demonstrated a simulated porpoising (nosing up and down in the water) exaggerated enough that I wondered if an upset might result, but the SeaRey resisted this abuse very well, speaking volumes of learning how to take off and land the airplane on water. The SeaRey's hull design strongly resists nose plowing; it simply won't do so without a protest. While some combination of power and pitch motion might cause problems, pilots need not be overly concerned about this. On normal water landings the advice is to touch down slightly nose-high as you want to meet the water on the hull step. Should you put the tail down early, a light push forward will return you to the step before you slow to a stop. On whole, the SeaRey was a most impressive boat on the water, acting very much like that's where she belonged. For example, a beaching demonstration proved enlightening. Kerry took the controls and aimed us at the far side of a lake that had no beach, instead having a marshy look with tall grasses. In spite of this slippery surface, I was pleased at the ease with which the SeaRey negotiated the grassy lake edge. Kerry demonstrated a roll up from the water with the extended wheels cooperating nicely. We swung around in a 180 on the lake's edge and headed back out for another takeoff as though it were no challenge to SeaRey. Gear extension made the beaching easy, but one must remember that submerging larger tires can overwork the system somewhat so you'll want to be at idle thrust. On our several water landings, the SeaRey showed excellent slipping ability and a pilot of Kerry's skills can hold this attitude until very near the water. No wonder the SeaRey doesn't really need the 35° of flaps. Kerry demonstrated a water takeoff where he put in full up trim, added power and shortly afterward released his grip on the stick.We lifted off at about 60 mph instead of the 45- to 50-mph where you would normally rotate, but the SeaRey flew itself off and maintained a reasonable climb. At a mid-range power setting of 4,500 rpm, at a few hundred feet after leaving water we were still climbing about 300 to 400 fpm without pushing the engine or airplane too hard. At cruising altitudes, you throttle back to cruise power when you'll observe about 90 mph (78 knots). Top speed is 113 mph (98 knots). Seaplanes generally aren't the fastest of airplanes but it's hard to beat their recreational appeal and their enormous versatility in landing areas. In my airborne trials, stall occurred at 45 mph (39 knots) with no flaps extended at idle thrust. Accelerated stalls reached full stick back at about 50 mph, but would not break over nor show any tendency to roll in or out, though the nose hunted a bit. Without the vortex generators, the SeaRey would show some nose break, Kerry recalled, but the vortex generators are standard and the SeaRey exhibits very low speed capability with them.With two notches of flaps, Kerry demonstrated a stall indicating 35 mph. In addition to vortex generators, this significant drop comes from new gap covers that Blazevic helped engineer. Back to hard-surface touch and goes, I found neither of my two SeaRey landings was particularly good.We approached at about 70 mph, which allows a significant reserve of speed. The objective is to fly low over the runway and hold off to touchdown. Perhaps it was the hull shape, but I kept starting my flare too high. Once down, you use the common taildragger technique of holding the tail down to settle fully. Kerry recommended I use two notches of flaps for both takeoff and landing. The added lift also helps pull the plane up on step and out of the water quicker. Even at gross weight, water or land runs are a mere 300 feet or so. This is admittedly hard to measure in the water so many seaplane pilots use time instead. The SeaRey gets on step in 4 seconds and becomes airborne in 6 to 8 additional seconds, says the factory. Of course, technique enters in significantly. 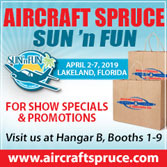 Gear Up and Flying Gracefully For summer fun - when so much seaplane flying is done - buyers will appreciate canopies that slide back independently. You can move them to any position during flight, although Kerry indicated you should take care not to fly at maximum speeds with the canopy(ies) full aft. Wide-open canopies do begin to affect prop efficiency, a sensation you can both hear and feel. The SeaRey's noise level was a bit higher than I expected in such a deluxe aircraft, however, the noise reduction is significant upon closing the canopy. Headsets or helmets are recommended. At a safe altitude, the SeaRey can cruise at 100 mph, with full-power level flight producing close to 115 mph. Normal cruising is done about 90 mph. The plane will allow a plowing flight, but once you have a feel for it, nosing over slightly will put the SeaRey on an aerodynamic step that I was able to notice within a single hour of flight. The SeaRey's roll rate is quite good, typical of Kerry's designs (I've had the pleasure to fly several of his designs over the years). Response proved to be about 3 seconds in the 45-to-45 roll reversal test, and stick forces were low. Pitch was nicely dampened leaving its pilot with an I'm-in-charge feeling. In mid-2009, a basic SeaRey Experimental Amateur-Built kit costs $29,900. 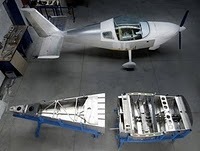 Equipped as the one seen in these photos with the Rotax 912 engine but with analog instruments and a finished interior, the cost will be about $65,000 to $70,000 in the air. As flown, this SeaRey in kit form would run about $85,000 and you'll invest 600 to 700 hours to build it. A first-time builder would probably take somewhat more, but Kerry explained the range is as low as 285 hours for experienced builders and as high as 1,000 hours. The entire interior is available in components for kit assembly. A ready-to-fly SeaRey will be about $95,000 once SLSA airworthiness is secured. Options will raise that total, but this still qualifies as one of the least expensive amphibious seaplanes you can buy. To spend any excess cash you have lying around, you can choose from a menu of options. Many pilots seem enamored by more power so if you want 100 horses instead of 80, add about $2,000. If you live in high-density altitude and carry a lot of weight, you might need the 115-hp Rotax 914. 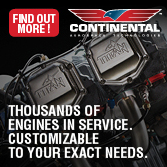 But it'll cost you a breathtaking $14,500 over the 80-hp Rotax. 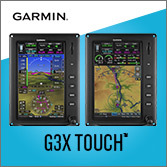 Of course, you can always select more avionics including the beautiful Garmin 696. Radios and EFIS are further choices. 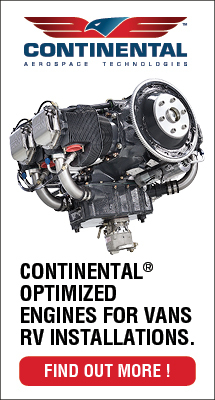 But to get a comprehensive price quote, you'll want to go directly to Progressive Aerodyne for the latest figures. The good news is that little of the SeaRey comes from outside the USA so their prices won't be subject to exchange rate fluctuations. Kerry and I discussed how high you might run up the final price and we didn't get much past $115,000 or so. Folks, among amphibious seaplanes in certified, readyto- fly form, the SeaRey constitutes quite a bargain. If you think these prices sound high, you haven't priced a seaplane or floatplane recently. Still, if your budget isn't that large, you always have the ELSA or EAB kit options that'll save quite a bit of money. To see a SeaRey up close, Progressive Aerodyne regularly displays at aviation events and regional shows around the country. For upcoming events, go to their Website: www.searay.com . With a SeaRey, you can expect some real fun on the water or on land. What pilot can't love that? Standard Features Rotax 912 at 80 hp; analog flight and engine instruments; retractable gear; hydraulic disc brakes; retractable shoulder harness; 18-gallon fuel capacity; 3-blade composite prop; manually operated flaps; electric trim; mechanical gear retraction system; 6-inch aluminum wheels with 4-inch steerable tail wheel; fully built LSA. Options 100-hp Rotax 912 or 115-hp Rotax 914; full electronic avionics including Dynon D-180 and Garmin 696; optional 26-gallon (total) fuel capacity; high-capacity wheels and brakes; ballistic parachute; interior upgrade options. Construction Aluminum airframe; fiberglass hull (carbon fiber optional); steel landing gear and other components; dope and- fabric wing coverings. US-owned company. Pros - Familiar, popular design from a well-established company and designer; some 500 flying (built from kits). More useful load/payload than other boathull amphibs. Substantially updated to meet ASTM standards brought a higher gross weight. Cons - Not a particularly fast design, if that's what a buyer is seeking. 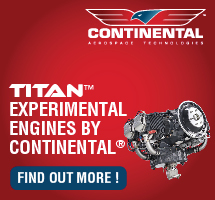 Construction is familiar to ultralight pilots, but is less common among Light- Sport Aircraft. At press time, company had not completed their SLSA airworthiness certification. Pros - Loaded with systems, including retractable landing gear and uncommon things like a bilge pump. Electric trim. Mechanical flaps. Hydraulic brakes. Audio warning system for gear position. Cons - Pilots must manage gear in the right position for land vs. water landings (though the optional warning system helps, if selected). Engine access is somewhat awkward and made harder with the nicelooking fairing. Pros - Generous 44-inch-wide cabin (though other LSA seaplanes are wider still). Sliding canopies are a delight as well as a very serious safety feature because exiting an upset seaplane may be easier with dual sliding canopies. Very comfortable interior. Cons - Entry and particularly getting up out of the seat may prove challenging to less flexible pilots (though structure around you is sturdy for handholds). Seats not adjustable. Shoulder belts only in test aircraft. Pros - Taxiing on land is good with responsive tailwheel steering, or on water, thanks to a water rudder located well aft, giving a good lever arm.Water handling is excellent, like a speedboat in an experienced pilot's hands. Great ventilation, thanks to sliding canopies. Cons - Even with a 10-inch draft you may be limited to calmer water like lakes. Gear stance places hull low to ground (though in an emergency, landing on the hull may be a good idea anyway). No differential braking to aid ground ramp maneuverability. Pros - Water landings work well and appear to require relatively modest skills, making the SeaRey a good starter amphib. Short 300-foot water runs and 10 to 12 seconds. Sliding canopy allows easy pier access. Beaching appeared almost too easy. Slips worked very well. Cons - Water landings were easier; on land, aircraft sits very low before touchdown; it takes some acclimatization (though gear is up to the task of instruction). Ground clearance is low to bottom of hull. Pros - The SeaRey has an excellent combination of predictable controls that are quite responsive. Roll rate was reasonably fast (about 3 seconds, 45-to-45). You never have to land crosswind on the water in a seaplane. On land, the SeaRey exhibited good control authority. Cons - Handling in water requires additional training (insurance will also demand more training). Downwind water handling can be particularly challenging in stronger winds. No other negatives. Pros - Water runs are short (300 feet) and are essentially the same on land or water. Climb is reasonable at 800 fpm with the 100-hp Rotax 912 engine (650 fpm with 80 hp). Seaplane landings are generally short. Excellent slow-speed flight characteristics; especially useful for sightseeing by seaplane. Cons - Amphibians are generally slower designs than fast land planes; cruise in a SeaRey is a modest 80 knots (though speed is not an objective of most seaplane pilots. Climb seemed a little weak, possibly owing to a higher empty weight on test aircraft. Pros - Stalls were almost nonevents; I found no clean break to any stall practiced. Slow stall at 35 knots with flaps; 39 knots without. Longitudinal and lateral stability checks and power changes from trim, level flight revealed a benign SeaRey design. Cons - Water operations require more training and you must mentally shift from airplane to boat. No other stability negatives discovered. 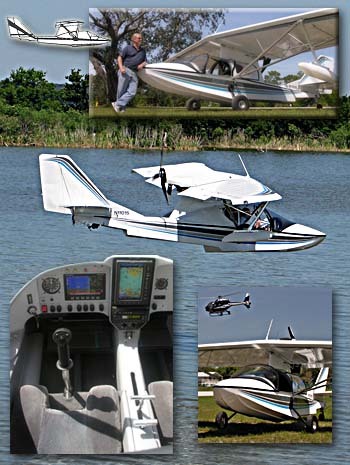 Pros - With 500 flying, the SeaRey is the most popular amphibian in light aviation; owners are loyal and support one another. Company is well established and has been managed by the same family since its inception in the early 1990s. The SeaRey is priced modestly compared to other LSA flying boats. Cons - The SeaRey is still awaiting approval as a Special Light-Sport Aircraft; until then only an Experimental Amateur-Built kit is available. At about $100,000 ready-to-fly, the SeaRey won't be in everyone's budget (but EAB or ELSA kits can dramatically lower costs in exchange for your labor). Let’s be honest. We’re into flying because we enjoy the experience, right? Flying light, sporting aircraft is not about flying to work or transporting goods or people. And if enjoyment is the main flying goal, then seaplanes are a big part of that pleasure. 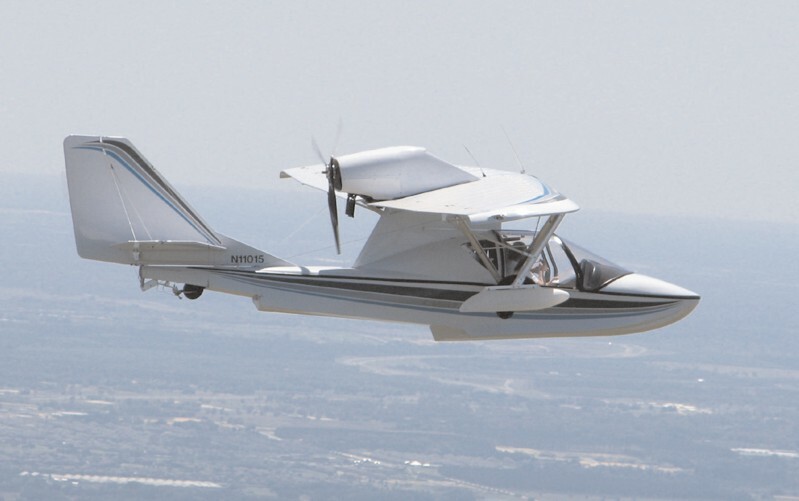 Of the LSA-qualified seaplanes covered this year (FPNA Cape Town A- 22 and Airmax SeaMax), the SeaRey is more familiar to readers of Light Sport and Ultralight Flying magazine and more affordable. The SeaRey is familiar because of its past in this community. It’s built and it flies as you’d expect, more so than some $135,000 carbon fiber speedster. It also costs a great deal less and it’s available as a kit to save even more dough. Make no mistake. The SeaRey LSX (the Experimental-LSA kit version) and the SeaRey Sport (the fully-built version in latter stages of certification) are advanced light planes, by which I mean SeaRey has developed significantly from its simpler 2- stroke-powered early models. SeaRey Reports Superb Oshkosh; Who Will Get #100? American Seaplane -- SeaRey is an all-American brand making the move from a kit-only operation to one providing fully-built SLSA and, eventually, ELSA kits. 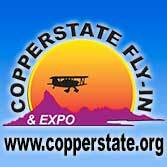 Watch for my full pilot report in the October 2009 Light Sport and Ultralight Flying. We sit on the edge of hitting triple digits of Special Light-Sport Aircraft. Just before Oshkosh started, Van's Aircraft announced their RV-12 qualified for SLSA airworthiness (which also allows the Oregon company to sell ELSA kits). People have started to ask, "Who will offer Number 100 SLSA?" One possibility is the SeaRey from Progressive Aerodyne. 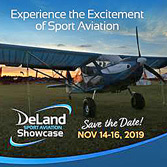 *** SeaRey marketing man, Darrell Lynds reported a spectacular Oshkosh event, "We sold 11 kit SeaRey aircraft (the LSX) and four SLSA versions to be called the SeaRey Sport." That represents quite a performance, causing me to inquire what amount of money changed hands in order to call these an order. "We collected $5,000 toward a kit and $10,000 on a fully-built SLSA," explained Darrell. I'd call that enough cash per airplane to make for genuine orders. *** I spoke with many sellers at Oshkosh who reported "very solid leads," and "genuinely interested buyers," but a few complained that despite these positive comments, they were not seeing the cash. *** SeaRey logged one of the best selling performances among LSA suppliers. The company has been working on LSA approval for several months and that follows years of successful kit selling. Close to 500 SeaRey kits are now flying and they've generated an intensely loyal following. Could the SeaRay Sport be SLSA #100? Only time will tell but we'll do our best to report the answer first. We sit on the edge of hitting triple digits of Special Light-Sport Aircraft. Just before Oshkosh started, Van’s Aircraft announced their RV-12 qualified for SLSA airworthiness (which also allows the Oregon company to sell ELSA kits). People have started to ask, “Who will offer Number 100 SLSA?” One possibility is the SeaRey from Progressive Aerodyne. *** SeaRey marketing man, Darrell Lynds reported a spectacular Oshkosh event, “We sold 11 kit SeaRey aircraft (the LSX) and four SLSA versions to be called the SeaRey Sport.” That represents quite a performance, causing me to inquire what amount of money changed hands in order to call these an order. “We collected $5,000 toward a kit and $10,000 on a fully-built SLSA,” explained Darrell. I’d call that enough cash per airplane to make for genuine orders. *** I spoke with many sellers at Oshkosh who reported “very solid leads,” and “genuinely interested buyers,” but a few complained that despite these positive comments, they were not seeing the cash. Aiding designer Kerry Richter (R) is Damir Blazevic, a German engineer now residing in Fort Myers with impressive credentials including work on the giant Airbus A-380. Kit prices start at $29,900 yielding about $60,000 once instrumented, painted, and powered by Rotax 912S. Ready-to-fly SLSA models will start at about $95,000 (not announced yet). See SeaRey LSX at the Sun 'n Fun 2009 LSA Mall just inside the entrance gate. Seaplane enthusiasts comprise a niche of American aviation but are some of the most passionate of all powered aircraft pilots. Among these, owners of almost 500 SeaRey aircraft belong to one of the tightest knit communities I've seen. Kerry and Wayne Richter, the son and father team that gave birth to the SeaRey (and several other models) have quietly built one of the strongest brands in light seaplanes... and now they are moving into the Special Light-Sport Aircraft space with their new LSX. Kerry says the new model, while visually similar to earlier SeaReys, possesses no fewer than 78 new or revised features including a custom interior and complete rework of the panel. *** I flew with Kerry in the new machine from my Florida home base at Spruce Creek Fly-in. We hopped LSX over to a nearby lake and Kerry executed a couple perfect water landings. Taxiing back is equally exhilarating with SeaRey behaving like a powerful speedboat. The "swept V-hull" cuts the water more smoothly than any seaplane I've flown. Stalls are extremely docile and this seaplane's speeds are impressive at better than 100 mph. Both qualities are aided by small, clear vortex generators along the leading edge. --- UPDATE April 12, 2009 --- A clarification: SeaRey's LSX model will be the company's entry as an Experimental LSA (ELSA). Their fully built SLSA model will be called SeaRey Sport. The ELSA model is relatively rare, given the industry's muted response to-date on the concept of a kit LSA that can be 1-99% completed by the factory. While a mostly done kit won't save much, it allows more flexibility regarding owner maintenance and modification. Seaplane enthusiasts comprise a niche of American aviation but are some of the most passionate of all powered aircraft pilots. Among these, owners of almost 500 SeaRey aircraft belong to one of the tightest knit communities I’ve seen. Kerry and Wayne Richter, the son and father team that gave birth to the SeaRey (and several other models) have quietly built one of the strongest brands in light seaplanes… and now they are moving into the Special Light-Sport Aircraft space with their new LSX. Kerry says the new model, while visually similar to earlier SeaReys, possesses no fewer than 78 new or revised features including a custom interior and complete rework of the panel. *** I flew with Kerry in the new machine from my Florida home base at Spruce Creek Fly-in. We hopped LSX over to a nearby lake and Kerry executed a couple perfect water landings.